The attempts of the puppy mill to relaunch their evil business are stopped. Last Tuesday the police went in and removed 12 puppies - 7 Hovawarts and 4 Golden's - and one of the mothers from the premises of the puppy mill. 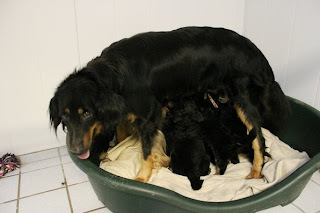 The mother dog on the photo is Cherry, safe and sound with her 4-week old pups in the shelter. The news that she is now found and rescued, is especially delightful. Like many other dogs used for breeding by the puppy mill, Cherry was bought by the puppy mill under false pretenses from a reputable breeder abroad. Now almost 6 years ago. When the puppy mill was exposed and the dogs were seized, Cherry was not among the rescues. The uncertainty started, if Cherry already had died, or if she still was in the claws of the puppy mill, being kept hidden somewhere. As we now know, Cherry was kept hidden because she was expecting puppies, and was already during the first raids earmarked by the puppy mill owner to be a part of the relaunch. Now Cherry like the others is out of this hell-on-earth, let's hope she can still grab her second chance for a better life. For Cherry's breeder, all the worry, feelings of guilt and powerlessness, can now find closure. The seizure of the dogs was a clear message to the puppy mill owner that - unlike how it went in the past - this time nobody is fooled by their claim to have stopped breeding, and they will not be lost out of sight, until they are trialed for animal abuse and neglect. A case - build up by "Dyrenes Beskyttelse" - that is well under way, but unfortunately will take to the end of the year to prepare and prosecute. In the mean time, we still have to keep our eyes open, as this will most likely not be their last relaunch attempt. We must assume, they still have Bamira somewhere, and the next relaunch victim might therefore already be chosen. It is good to notice that two important allies are added to the opposition of the puppy mill. First, the police. So reluctant to do anything before, they didn't hesitated this time to move in and seize the dogs. Secondly, the Minister of Agriculture & Animal Welfare, Mette Gjerskov. As we know she is working on a proposal to change the legislation for dog breeding operations. And as an indication of her focus on the case, she even had the news on her FB page before me. A prelude to some legislation that can stop this once and for all? That is good news. Sounds like they are actually doing something. Super good news! I hope Cherry is able to find a good home that will help her learn to be a dog again. Ugh! These breeders are amazing aren't they? So glad Cherry and her puppies were found and are now safe. I am not surprised at all. Our notorious breeder, Kathy Jo Bauck, tried something similar and was caught. In the end she had to agree not to breed and sell any more dogs or face a 1 million dollar fine and other penalties. She took the deal. It's nice to see some good news. I hope the trial shuts down this breeder for good. Wonderful news, Kenzo! Hopefully, with all this Internet coverage of their misdeeds, they aren't able to get more dogs to continue their abuse.